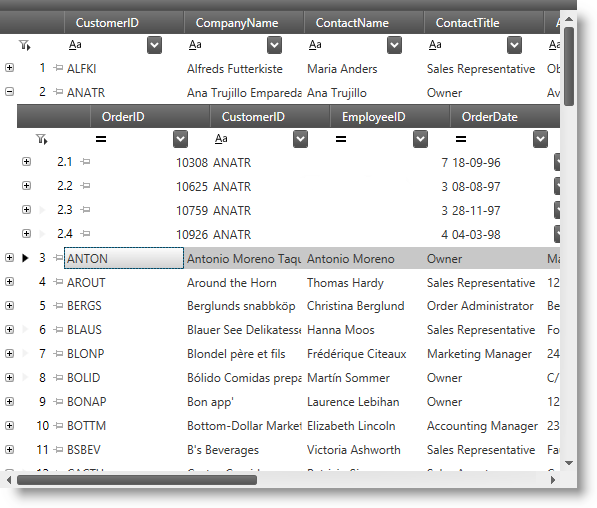 This section contains topics covering the xamDataGrid™ control for WPF. This topic provides an overview of the xamDataGrid control including a conceptual diagram of its comprising elements. This topic provides step-by-step instructions on how to add a basic grid to your page. This is a group of topics explaining how to bind the xamDataGrid to different data types. This is a group of topics explaining how to use the xamDataGrid control and manage it programmatically. This is a group of topics explaining how to style the various visual elements of the xamDataGrid control and how to modify the build-in themes to manage the look-and-feel of the grid. This is a group of topics explaining how to improve the performance of the xamDataGrid in your application. This topic provides reference information about the namespaces and classes related to the xamDataGrid control.